The Punctuation & Mechanics CD also offers over thirty narrated lessons and rounds out the instruction by taking students beyond the parts of speech to the application of rules. How many times have you learned, after instructing a class in punctuation, how little they have actually understood, or for that matter, retained? Even a 70% passing grade suggests that students have failed to master 30% of the lesson. And if research holds true, they will forget over half those answers in only a few days. Consequently, you are caught in a vicious cycle of instruction, student work, correction, and further instruction. With our Punctuation & Mechanics CD, those days are over. After the narrated text, students are taken step by step through each piece of information and then progressively challenged—without realizing it—to correct even the most difficult sentences. If they make a mistake (just as with the Sentence Structure & Parts of Speech CD), the program will inform them, at that precise moment, and then offer them clues to work toward the right answer. Students are then encouraged to master 100% of the lesson while still grading their mistakes. You are spared the drudgery of checking and rechecking papers, and freed to do more creative work…to chisel and fine-tune writing skills and offer advice in "real world" writing and composition. Such freedom is normally experienced only by teachers of "Gifted Students." Since grammar is systematic, it can be taught on a computer, and since a computer never gets tired, it can repeat key words and grammatical patterns to the degree that they become internalized in the student’s mind. Words and patterns act as road signs, indicating the direction each sentence takes. For example, the subordinator ”If” at the beginning of a sentence points in a specific direction. When it is internalized, the student—without thinking—knows that an introductory clause follows the word “If”; that a comma follows the introductory clause; that a main clause follows the comma; and that a period follows the main clause: “If” writers internalize key words and patterns, they will begin to write clearly and effortlessly. As more words and patterns become internalized in the student’s mind, this verbal picture—like the pieces of a jigsaw puzzle falling into place—becomes clearer and clearer. With thirty or forty students in a class, most teachers do not have time to repeat these key words and patterns to the degree that they need to be repeated! In order to know where the comma goes in this sentence, you must first know what a clause is (has a subject and verb), what an introductory clause is (a dependent clause that comes at the beginning of a sentence), and finally what a main clause is (a subject and verb that stands alone). THIS IS WHAT WE TEACH IN THE GRAMMAR KEY SRUCTURE AND PARTS OF SPEECH CD-ROM. 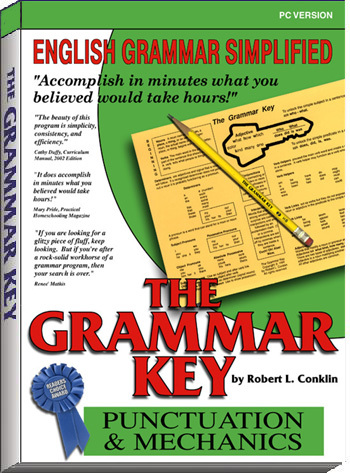 Understanding of mechanics and punctuation of the English language is made simple with The Grammar Key.